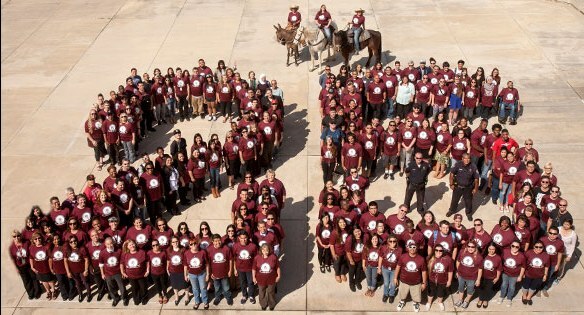 NORCO– Norco College celebrated its 25th Silver Anniversary last month with a group photo, a time-capsule opening and a western-style jamboree. Norco College, a branch of Riverside City College, first opened in 1991. Riverside Community College leaders first began to dream about a branch campus in the area in the early 1970s. On June 4, 1985, that dream was realized when more than 141 acres of U.S. government-owned land—the site of what would become Norco College—were acquired by RCCD for one dollar to build a satellite campus. The campus was expected to open in 1989, but funding and construction delays pushed the date to 1991. On March 13 of that year, two classrooms in the Student Services and Little Theatre buildings were ready for students, and about 15 short-term classes in economics, philosophy, public speaking, and a handful of other traditional academic disciplines were held on campus that spring semester. (Approximately 100 other classes that began in January were taught in Norco area high schools and a church, as they had been for years.) The formal opening of the full campus (with two more classrooms: Science and Technology and Humanities) took place in the fall of 1991— coinciding with the 75th anniversary of Riverside City College. The celebration, which included music, a snow cone truck, a birthday cake and real horses, brought in to represent the Norco Mustangs, was just part of the fun for students. A large group of students had their photo taken on the quad as they stood in the shape of the number “25”. A time capsule left by the 1991-1992 Norco student body was opened on March 10. Math Professor Bob Prior, who was also the Student Activities Coordinator in the early years of RCC’s Norco Campus, led the unveiling with special guest Pedro Argumendo, retired Grounds staff, who helped bury the time capsule in the 1990’s. Included in the capsule were Norco College flags, a university-edition Bible, a student I.D., a photo CD and a convocation booklet, among other items. On March 12, Norco College continued its 25-Year Anniversary celebration with a western-style jamboree that included individuals from the cities of Norco and Corona, RCCD Board of Trustee members, and current and past employees of the college.